Crayfish capture people’s attention: they are abundant, yet secretive and somewhat elusive, and just the right amount of scary to pick up. For all of these reasons, they have been a staple of the White River Partnership’s watershed education program since its inception in 2010. 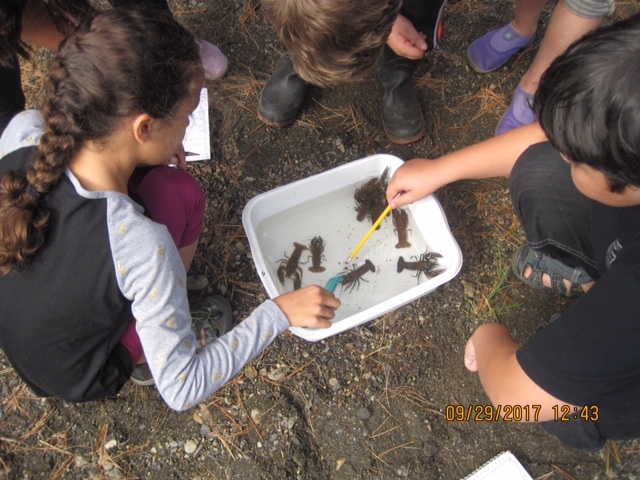 Through the WRP crayfish unit, students and teachers learn about the important role crayfish play in the river’s food web and how the food web might be impacted by the proliferation of non-native crayfish species found in many parts of the watershed. Students also learn how to identify White River crayfish species and put those skills to use out at the river. It’s pretty clear that students love looking for crayfish in the name of science! Another exciting aspect of the WRP program is that the field data collected by students doesn’t just end up on a shelf. Instead it is shared with Vermont Department of Environmental Conservation scientists who use the data to enhance their understanding of crayfish distribution throughout the state. The WRP program also serves as an early-detection system since the state is constantly on the lookout for the arrival of new crayfish species. The 2017 data sharing component is being funded by a generous grant from the state’s Grant-In-Aid program. Follow this link to learn more about crayfish and other WRP watershed education units.